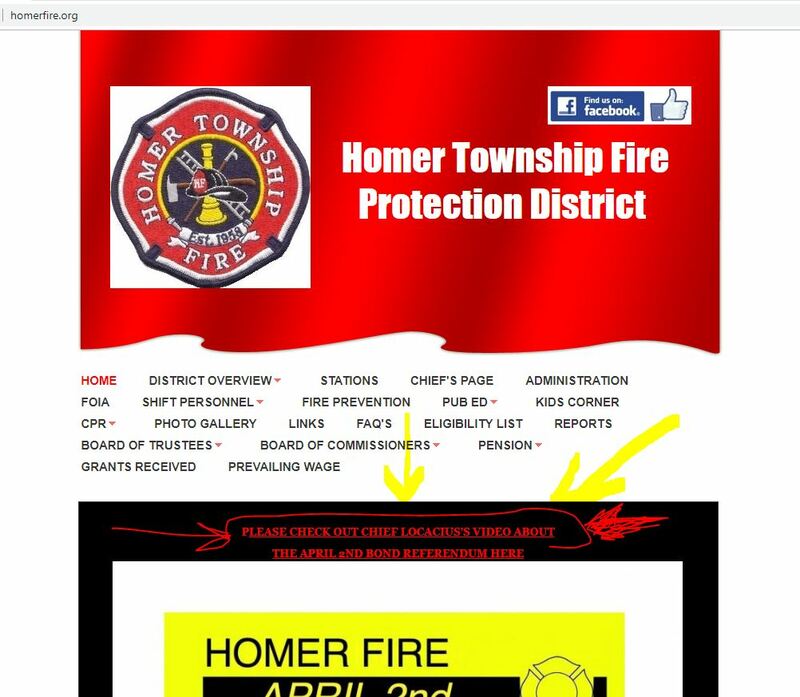 It appears that the Homer Township Fire Protection District is electioneering using fire district resources. On its webpage, HomerFire.org, it prominently displays a link to a video of the Fire Chief “explaining” the Bond referendum to those who choose to watch it. UPDATE: The District deleted the information and video link from its website, but we captured it prior to publishing this article, You can see a screencap of the webpage as it was (here) and a screencap of the video as it was (here). 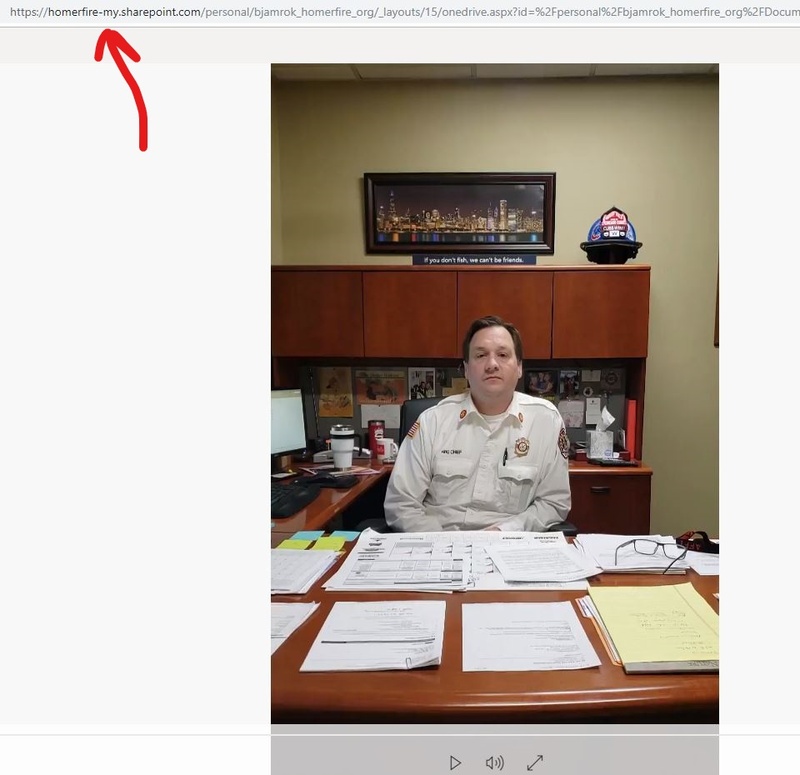 In the linked video, at about the 1:17 mark, the Fire Chief states: “I’m asking the residents to come out on April 2nd and vote for the referendum.” Additionally, this video was apparently filmed in the Chief’s office at the Fire Protection District. A public body advocating for or against a voter referendum is considered electioneering. Creating and linking to this video, in our opinion, constitutes “Prohibited Political Activity” as that term is defined in the State Officials and Employees Ethics Act – 5 ILCS 430/1-5(1), (7), (11), and (12). The Prohibited Political Activities section of the Act (which all local governments must follow – see Section 70-5 for this mandate), 5 ILCS 430/5-15(a) describes in detail the prohibition. (1) Preparing for, organizing, or participating in any political meeting, political rally, political demonstration, or other political event. (7) Soliciting votes on behalf of a candidate for elective office or a political organization or for or against any referendum question or helping in an effort to get voters to the polls. (11) Distributing, preparing for distribution, or mailing campaign literature, campaign signs, or other campaign material on behalf of any candidate for elective office or for or against any referendum question. (12) Campaigning for any elective office or for or against any referendum question. Local governments are required to adopt an Ordinance no less restrictive than Section 5-15 and the Gift Ban Section of this Act. Additionally, the Illinois Election Code provides a prohibition on the use of public funds (which also includes public resources like websites and using public buildings to create advertisements) since they are paid with public funds) for urging any elector to vote for or against any candidate or proposition. I’m sure the self proclaimed “most powerful person in Champaign county” will take a serious look in to that. The very short and powerful SA Julia Reitz will take kindly to a couple of non lawyer regular guy types bringing that up with her. Please, for the comedy aspect, inform her. Why would we tell the Champaign Co. State’s Attorney? This article is from Will County. Please read prior to commenting next time.